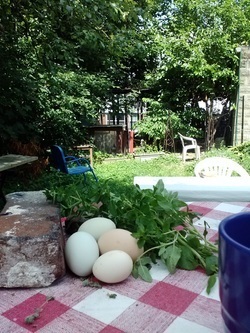 This is an example of the coop setup we currently offer through our partnership with Green City Growers (click here to sign up for a consultation!). 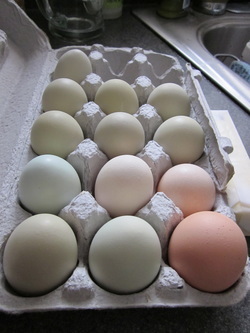 Our coops are custom-made for us by Coops for a Cause in central New Hampshire and our complete coop packages start at $3450. 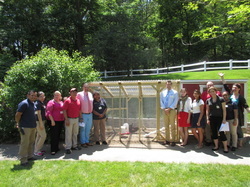 The coop pictured here lives in the garden of the memory-care wing at the Goddard House Assisted Living Facility in Brookline, MA. 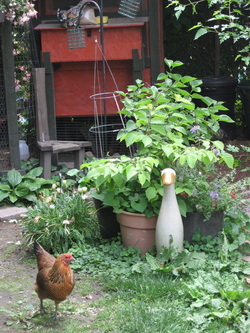 This setup is large enough for 6-10 hens, and is fully predator- and pest-proof. The front wall hinges open under the window to access the internal nest boxes, and there is a large access door on the far right side for cleaning. We also have an additional wire-covered window on the back side for extra ventilation in the summer, and there is ample ventilation along the top edge of the front and back walls for winter airflow (no supplemental heat neccesary!). 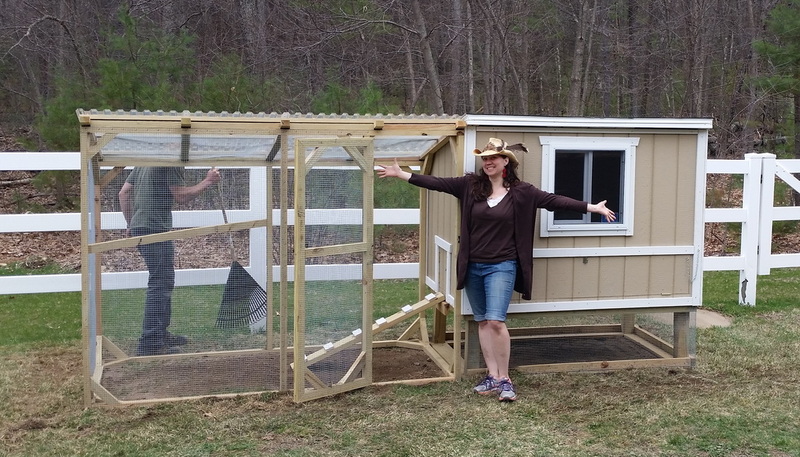 In this combination, the house section is 4'x6' and the run is 8'x8' for a total footprint that is 14' wide and either 4' deep (on the coop side) or 8' deep (on the run side)'. 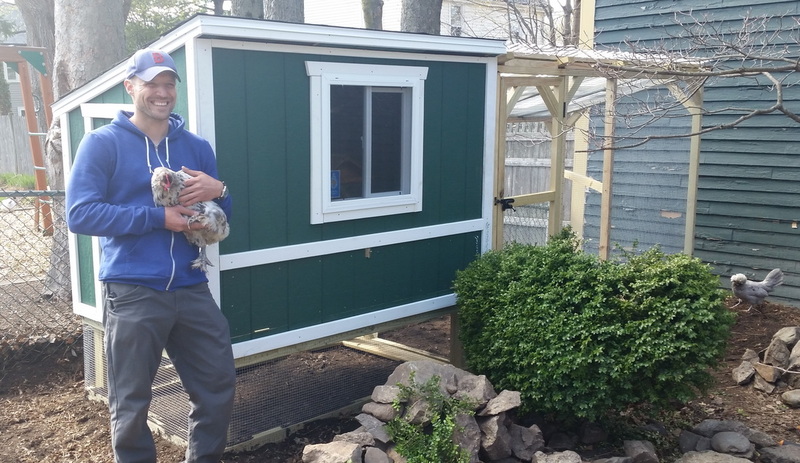 We also offer smaller combinations for 4 or 6 hens that has a 4'x4' coop and either a 4'x8' attached run for a total footprint of 4'x12', or a 6'x8' attatched run for a total footprint of 4' (coop side) or 6' (run side) by 12'. 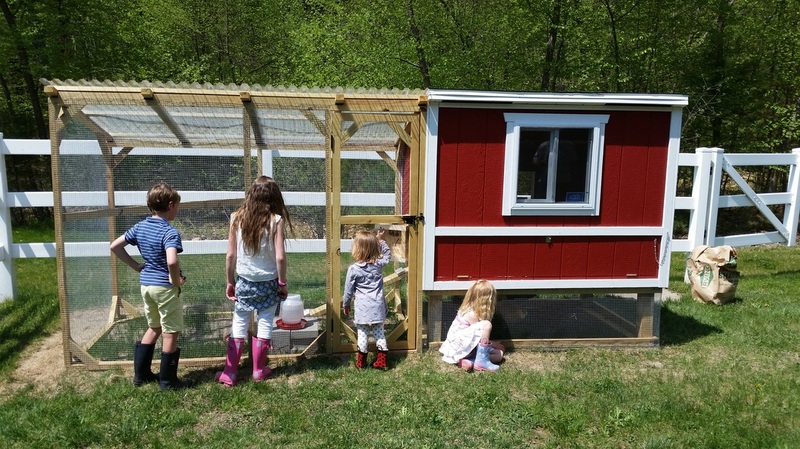 Whichever size you choose, our full coop setup comes with everything you need, including chickens and care training for you and your family, as well as follow-up visits to ensure your new flock is settling in smoothly! 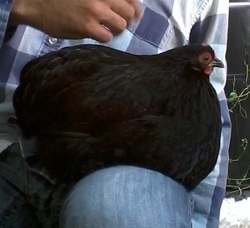 Lucifer: the sweetest chicken ever. Lucy was hatched in my bedroom on October 2nd, 2011, from eggs I got from a fantastic bantam cochin breeder I found through the BackyardChickens.com forum. 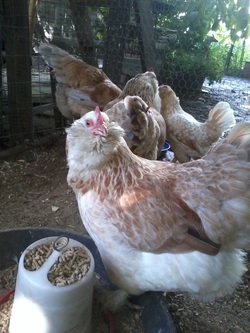 ("Bantam" is the smaller of the two size classes in chickens - the other is "standard" or "large fowl" - and "cochin" is the breed.) Since it was too cold to put her and her siblings outside by the time they got most of their feathers, they ended up spending their first 6 months living in my room, and getting handled a LOT. As a breed, bantam cochins are known for being very easy to tame, so add that to all the love they received as chicks, and you have a darling little bird who comes running up to you and is happiest napping in your hand or lap. She's also a chowhound who gets very excited about leafy greens and veggies, and will try to eat nearly anything, including freckles. Me and Lucy wtih Somerville's Mayor Joe Curtatone! Sweet Pea: the "normal one". 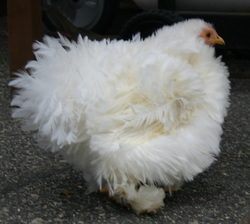 Gabby is a white "frizzle" bantam cochin, and is Lucifer's sister-from-different-parents (though the same fabulous breeder). Having the frizzle feather gene means that all of her feathers curl up instead of down, and makes her look, well... like a fluffy adorable flower, and also kind of ridiculous. Despite also being raised in my room and getting handled just as much as Lucy, Gabby is quite the drama queen. She's happy to sit on your lap or some other relatively solid surface, but anytime you pick her up or pet her she makes these screechy sounds of affronted doom! 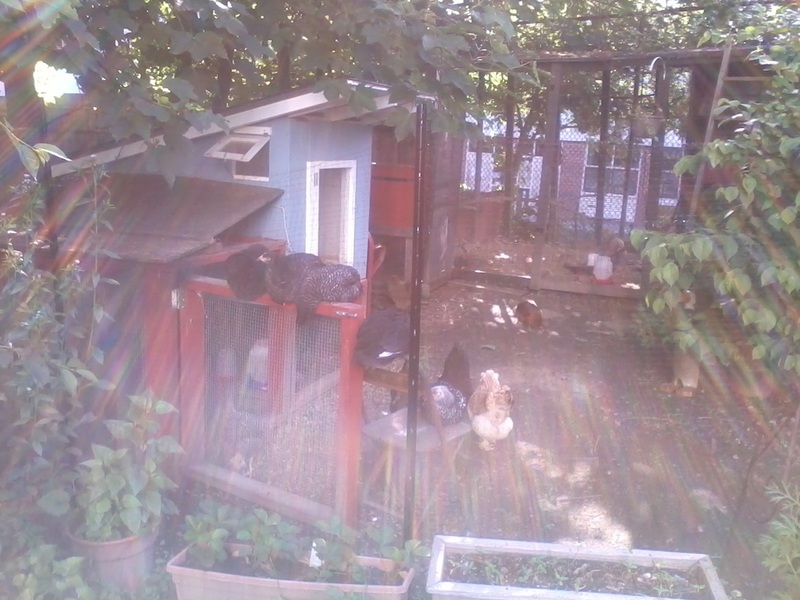 It's not just people, either - she does the same thing anytime any of the other hens come too close to her... screechy screechy SHRIEK screech. Despite that, she is quite happy being the center of attention at schools or festivals, and often goes right to sleep. Truly an enigmatic little creature. Fleur was one of my favorite little birds ever. She is my favorite breed - a Belgian bearded d'Uccle - and I purchased her from a local d'Uccle breeder at the New England Poultry Congress show in January of 2010. She is one of the smartest chickens I've known. 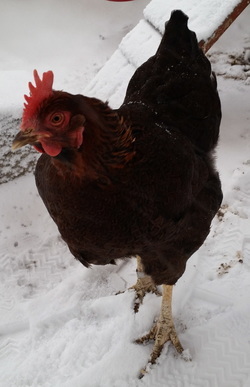 One of my favorite stories to tell about her is about the day the door from the yard to the chicken pen blew closed, and while everyone else was frantically pacing in front of the closed door, Fleur was systematically walking around the coop looking for another way in. She's also notorious for finding very sneaky spots to lay her eggs, which really gives further appreciation of the historic necessity of an Easter egg hunt. "What's in there? Is it food?" "No, I think you should use an impact driver to screw that in because that wood is pretty dense." Fleur is extremely popular at festivals and events largely due to her unusual markings and feathering... she is named for her color, called "mille fleur", which means "thousand flowers" in French. 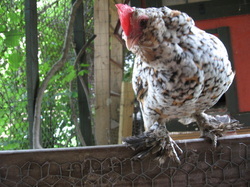 Each of her feathers is a mahogany brown, with a black chevron edging a white "spangle" at the tip of the feather, and the overall effect is a speckled hen! This breed also has very heavy foot feathering, which makes it look like they're wearing flippers all the time. Watching them attempt to "run" is a source of endless endearment and hilarity.